Rewards Canada: Rewards Canada's popular Credit Card Charts get their first makeover in 15 years! 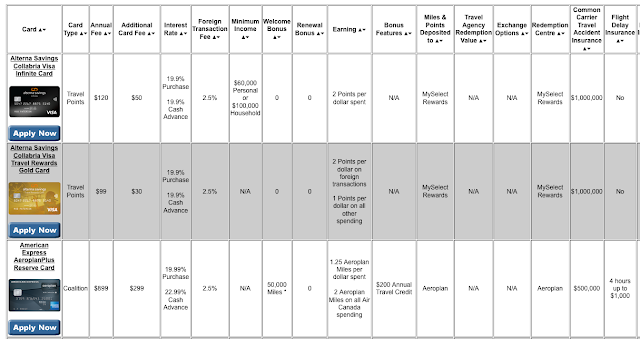 Rewards Canada's popular Credit Card Charts get their first makeover in 15 years! Today marks a big day for Rewards Canada! 15 years after we first launched Canada's first credit card comparison charts they have received their first esthetic update since 2004! Sure the information in the charts was constantly updated but the actual look and feel of them had not been touched since we first launched them and it was time to do so. You'll notice some of our original comparison info is no longer in table, such as Minimum Credit Limit but you'll also we have added in more detail into the insurance and benefits section so that you can better compare things like travel medical insurance, flight delay and so on! Let us know what you think of the new charts in the comments below! If you find any mistakes or items that need updated please let us know as well! And if you know how to lock the headers please feel free to contact us as well to speed up the process!